Can George change his luck? Despite all the bad things that keep happening, underneath it all, George is hopeful and struggles to keep trying. George has to overcome his fears and not inconsiderable bad luck as he, Ada, Oscar, and an orangutan adventure across Europe meeting both inspiring and threatening characters along the way. Ada uses her inventions, which include a flying machine, to help them on their journey. Her character, and that of Oscar, are integral to George’s success . The Inventors at No. 8 is an exciting story that celebrates intelligence, independence, science, and perseverance. Incredibly, some of the most interesting aspects are borrowed from real life. I think it’d be a plus if that info was in the front material, rather than an author’s note after the book. I think it’d be fun to guess which inventions and events were real versus those the author imagined. 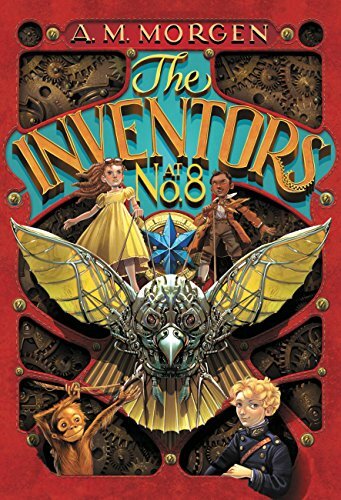 A fun enjoyable read, The Inventors at No. 8 is a tale about being brave, taking chances, friendship, family, and much more. Lots of pondering material and good conversation starters here in addition to just being quirky and fun! Highly recommended.